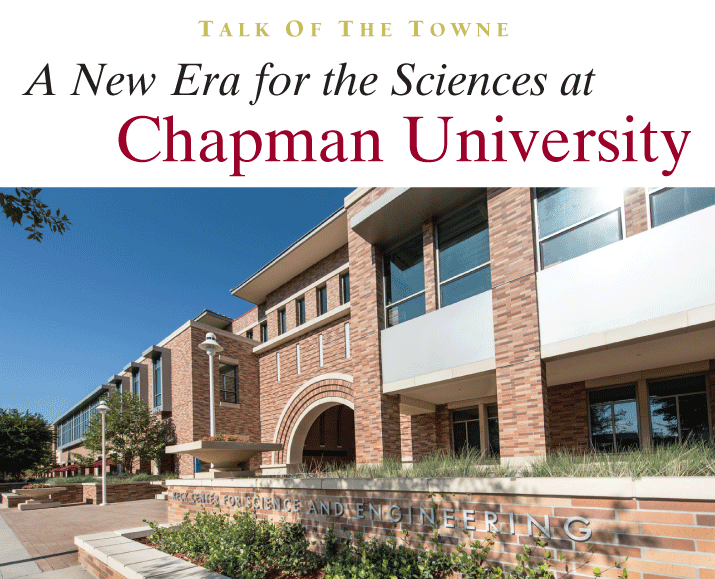 If you didn’t already know that Chapman University has a hugely ambitious plan for growth in the sciences in the near and coming future, you definitely would realize it after taking a look at the university’s very large and elegant new science building. The $130 million Keck Center for Science and Engineering, which formally opens this fall, is Chapman’s largest building, at 140,000 square feet, rising like a long mountain plateau on the northeast corner of the campus. The naming of the building is a result of one of the largest foundation gifts to Chapman: $21 million from the W. M. Keck Foundation, representing Keck’s first major naming in Orange County. Looking at the building today, with its external architectural elements harking back to Frank Lloyd Wright’s Prairie Style and its gleaming, state-of-art interiors, classrooms and laboratories, it’s hard to believe that its design started out with then-Chapman President (now President Emeritus) Jim Doti drawing a simple idea on a Post-It note. But it’s true. Early on in the planning stages, Doti paid a visit to the office of Kris Eric Olsen, Vice President for Campus Planning, and dashed off a sketch on a yellow sticky note. It was the basis of the building we see now: the long rectangular north-south footprint, with a hall on either side of a main grand entrance. Doti’s most engaging idea, also noted on that Post-It—to build seating into the west-facing façade of the building, which faces the university’s football field—has also become a reality. Eight-thousand-square-feet of bleacher-style seats will form the “visitor” side of Wilson Field, Chapman’s football/soccer stadium, and can also serve as an outdoor classroom/lecture space. Chapman is the only university in the world that’s known to have stadium seating built into the side of one of its science buildings. So what’s inside this new palace of the sciences? The 2.25 acre complex consists of two halls—the Hall of Science and the Hall of Engineering—connected by a dramatic archway entrance inspired by Wright’s V.C. Morris building in San Francisco and certain Wright houses in Chicago’s Oak Park. Come see all of this during the grand opening of the Keck Center on Thursday, October 11, with the ribbon-cutting ceremony at 4:30 and an open house at 5 pm. Check out fascinating elements, such as the marine biomechanics lab, where sea creatures are studied for their slimy secretions that may one day be useful in industry. Also see the atomic-force microscope that can examine infinitesimally small particles down to nanoscopic levels.